Our panelists will be from the County and the City. They will be presenting briefly each of their perspectives as they have been working together. We will have a short question and answer period after the panel discussion and presentation. After a puffy fluffy City Council meeting today, but with passage of certain place-holder measures that don’t actually disperse the San Lorenzo campground in the immediate future and promise “rent control discussion” at the next February meeting, HUFF continues on its weary way with its second January meeting at the Sub-Rosa at 11 AM Wednesday January 24th. Positive news: tenant advocates have turned in the wording for a Rent Control Initiative to be examined by the City Attorney; First They Came for the Homeless–a tough and tenacious homeless-run encampment in Berkeley has won a hearing in their lawsuit against the City of Berkeley for violating their First Amendment rights in 16 separate police raids; Sleeping Citations in October and November from Parks and Recreation are down–according to hardworking Citation Searchers Laura and Gloria. On the Agenda: City Council Report, Encampment Defense Discussion, Berkeley’s Feisty First They Came for the Homeless lawsuit advancement–its Santa Cruz implications, the Latest from the Lapis Road RV Struggle from Beggarbacker Becky (depending on weather conditions), and whatever comes out of the usual HUFF turmoil. You can also contact HUFF central by phone for assignments, reports, and updates at 831-423-4833. We need help reviewing the SCPD’s Citation record to see how accurate Chief Mills’ “No Sleeping Ban Citations at Night on Public Property” policy aligns with SCPD practice over the last 2-3 months. For outside updates, check out Facebook pages for Santa Cruz Food Not Bombs and Santa Cruz Homeless Outside. Don’t forget to check in on archived audio of Bathrobespierre’s Broadsides if didn’t catch the Sunday morning or Thursday evening broadcasts. Go to huffsantacruz.org and click on “Lost Shows”. Interesting stuff. Location Details Expect light rain at City Hall where Freedom Sleepers will gather both under the eaves and later along the sidewalk after the likely midnight police raids driving them out to get drenched. Thousands of Women’s March protesters crowded the same area Sunday filled with righteous anti-Trump anger but visibly indifferent to City Council’s abuse of unhoused and unprotected women outside here. Denounce nationally. Ignore locally. The 2:30 PM City Council agenda ignores homeless and housing issues as well as abusive police practices, local income equality, and discriminatory law creation and enforcement. Will bathrooms adjacent to the area likely to be locked early, facilitating staff smears of homeless folks as dirty and uncivilized in their toilet behavior? A safe bet. Last week Food Not Bombs soupstirrer Keith McHenry and weary copwatcher “Push Back” Pat Colby reported repeated “wake up and get out” rousts by rangers and cops at Freedom SleepOut #80. Dreamcatcher, a long-time Freedom Sleeper, reported Monday night that police told him he could sleep anywhere but at City Hall if he’d abandon his protest. This, and more property confiscation, led him to announce his departure from the protest. Lawrence “the Viper”, on the other hand, while also reporting police theft today, insisted he’d be back to pitch his tent at Freedom SleepOut #81. His signature tent, sleeping bag, and blankets are reportedly in lockup at police HQ, perhaps to test his stamina against driving rain and near-freezing temperatures. 71-year-old Sharee—who said she slept on cardboard last week, also reported being driven out from under the protective corridors of City hall last week. Though some are skeptical, others suggest the massive Trump-activated protests may swell the ranks of local anti-poverty activists. One activists has spoken of moving the Freedom Sleepers down to a more prominent post on Pacific Avenue. Others have suggested making use of the heated City Hall buildings, wastefully empty at night. “Vacant Buildings are the Crime”, noted one. Meanwhile it’s still hot soup Tuesday night, police harassment Wednesday morning, comforting coffee at breakfast time—all under the friendly drizzle of irregular showers. Who could ask for anything more? Bring tarps, blankets, sleeping bags, video devices, and high spirits. TOO FRAIL, SICK OR SLEEPY TO JOIN THE PROTEST? THERE ARE OTHER ALTERNATIVES. For those not eager to trek to the edge of town to seek a 4 PM place in the 110 person Winter Shelter program, “Big Drum” Brent Adams has announced a one-night Warming Center at the Red Church on Tuesday night. Agenda Suggestions for HUFF (bring your own! ): Freedom SleepOut #50 Report from the Sidewalk, June 24 10 AM Judge Trial of two Freedom Sleeper citations–using the fabled agenda/pathway/govt. center defenses (See”#50–Freedom Sleepers Keep the Faith ” at http://www.indybay.org/newsitems/2016/06/16/18787630.php ); Supporting the L.A. Activists Against the Proposed Vehicular Sleeping Ban; and whatever else goes with coffee! SFPD: Direct Action and the Police Murder of a Third Man Got the Resignation of Police Chief Greg Suhr; SCPD: Continuing Stonewalling on Public Records; Yet More Rant & Review Covering Last Council Meeting’s Passage of the “Vanish the Vendors” Law, Coming Up Again for a Final Reading shortly after 2:30 PM Tuesday May 24th in City Council Chambers. The show broadcasts at 101.3 FM and streams on the internet at freakradio.org at 9:30 AM – 2:30 PM (May 22). It will archive at http://www.radiolibre.org/brb/brb160522.mp3. The show broadcasts at 101.3 FM and streams on the internet at freakradio.org at 9:30 AM – 2:30 PM (April 17). It will archive at http://www.radiolibre.org/brb/brb160417.mp3. HUFF Definitely Back at Sub Rosa Tomorrow (Wednesday December 2) 11 AM. Coffee guaranteed!! HUFFsters: No more trekking around to mingle with seclusive students sipping bourgeois beverages at the Pergolesi–at least this week! Back at the usual Sub Rosa Cafe surrounded by lots of literature and agreeable reasonably priced (free) drinks. Today (Dec 1) there will be a special 5:30 PM “New tactics, new energy? !” meeting to protect the rights of houseless people at the Supply Room of the Red Church. Want more Freedom SleepOuts and like actions? Join the meeting! And come to Freedom Sleep-Out at City Hall tonight thereafter. Speak-Out Before and At Santa Cruz City Council Celebrating a Homeless Rights Victory at the local ACLU Board of Directors on June 30th. Presentation of Petitions and Demands to City Council to Overturn the City’s Anti-Homeless Sleeping Ban. I, other HUFF activists, and homeless victims of the City’s Sleeping Ban will be coming to Oral Communications tomorrow to support this statement and ask that the Council take immediate action to implement it. There is a clear lack of shelter space. There are the safety problems created by the criminalization of the homeless–more for the homeless themselves than for those who fear or blame them. Lawsuits in other jurisdictions have been successful in overturning anti-homeless laws. I encourage you and your fellow Council members to act swiftly to restore basic civil and human rights to the homeless community here. One of the most basic, of course, is to be able to sleep at night and to be secure in one’s property. If one is in danger of having it confiscated because sleeping is “illegal” after 11 PM, then one has no such security. 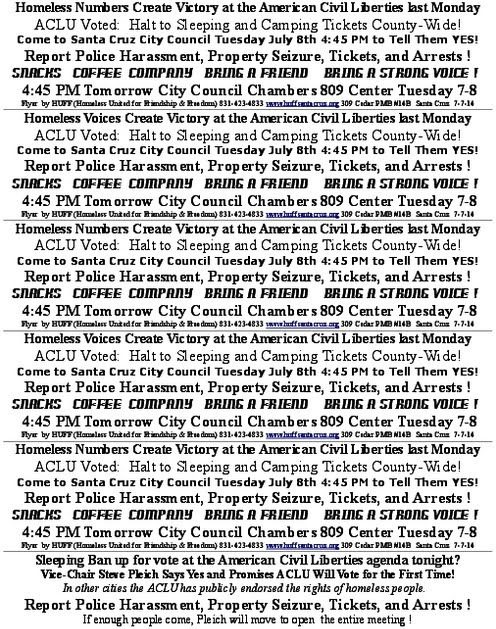 As a Free Radio Santa Cruz reporter, I will be audioing the meeting for broadcast. I assure you this will be done in a non-disruptive manner as has been the case without exception in the past. I encourage you to respect the rights of the media, even those critical of your positions on various issues, to audibly make their own record of the meeting, as guaranteed by state law and the Constitution. Earlier story on Mayor Robinson’s false arrest for “unattended audio recording at City Council” at http://www.indybay.org/newsitems/2014/05/03/18755258.php . On June 19, 2014, a federal court of appeals struck down a Los Angeles city ordinance which criminalized vehicle dwelling. The court held that the law, which banned the use of a vehicle as “living quarters”, was unconstitutionally vague and subject to arbitrary, discriminatory enforcement. This may seem like a Los Angeles problem, but to those immersed in Peninsula politics, it sounds eerily familiar. Why is this a Palo Alto issue? Because the Palo Alto vehicle habitation ordinance (VHO) is identical in every important way. Both laws criminalize living in a car, but leave important questions wide open. The Palo Alto law attempts to define “human habitation” as “the use of a vehicle for a dwelling place, including but not limited to, sleeping, eating or resting”, but if anything, this just makes things less clear. In response to this ambiguity, many have asked me what conduct is prohibited by Palo Alto’s new ordinance. The problem is, nobody knows. If Grandma and Grandpa take a trip from Seattle down to San Diego, and they pass through Palo Alto, they are dwelling in their RV. Are they violating the law? If I grab a burger from a drive through, and consume it in my car, am I “dwelling” in my vehicle? The answer is “yes” to both questions, but wait! Are we really going to arrest Grandma and Grandpa, with the possibility of up to six months in jail, for driving through the City in a mobile home? Of course not. And therein lies the problem. My clients, who have been driven out of house and home, are using their vehicles as a last place of refuge. And they will be prosecuted. As I read the court’s decision, I was struck by the similarities between the Los Angeles plaintiffs and my own clients. Catastrophic medical problems or sudden income disruption are common causes of homelessness. Yet, when the citizens of Palo Alto asked their Council for a solution, they did not call for a better safety net or more shelter beds, but instead for prosecution of the unhoused. This is exactly what Los Angeles tried, and the federal court invalidated the law. Palo Alto can expect the same result if it begins enforcement, because I can personally guarantee that the law will be challenged, and not only for vagueness. The Council might even try to write a better version of the law, and eliminate ambiguity. However, the law is unconstitutional on other grounds. The courts have long recognized that laws criminalizing basic human necessities, such as eating and sleeping, are fundamentally unfair. Since someone who owns no private property cannot be expected to sleep and eat in a private place, we cannot punish them for doing so in public. The Los Angeles plaintiffs picked one potential challenge to their ordinance, but there are others. In the end, though, this is not a legal problem, but a moral one. If we continue to look for ways to end homelessness by outlawing it, then we will continue to punish people for being unhoused, instead of addressing the root causes of poverty. These are not nameless, faceless vagrants, worthy of our contempt. They are our neighbors, our fellow citizens, and my clients – and I will not allow them to be punished for their status or run out of town as undesirable. William Safford is a criminal defense lawyer in Palo Alto and founder of Homeless Criminal Defense. The full text of the Ninth Circuit’s decision in Desertrain v. City of Los Angeles and other information can be found at http://www.HomelessCD.com. 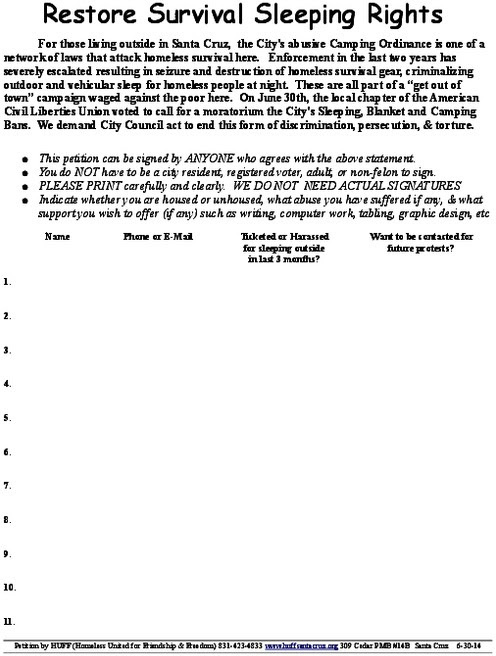 Enforcement of the Palo Alto law has been temporarily suspended, but the City Attorney’s office has stated that it will be advising the Council of the meaning of Desertrain before the end of the year.